Disgo is an Irish-based electronics retailer that produces a variety of consumer devices. 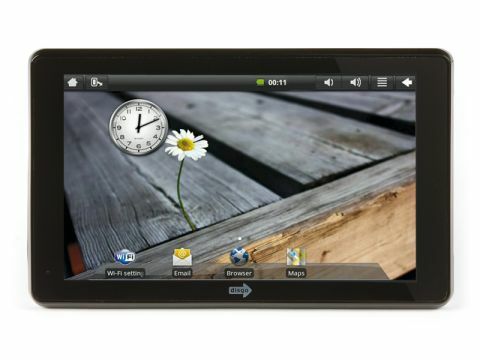 The Disgo 6000 is the company's Android tablet and makes a portable but flawed choice. Unlike the Apple iPad and Dell Streak, the Disgo features a resistive touchscreen. It's not nearly as responsive as we would have liked, and the keyboard is terrible to use and won't suit typists. In fact, if it wasn't for the bundled stylus easily pulled from the back of the device, the tablet would be borderline unusable. Only when using the stylus does the system work sufficiently and we found scrolling between home screens and through menus proved relatively intuitive compared to the Elonex eTouch 1000ET. The 7-inch screen features an 800 x 480-pixel resolution that is functional, but lacks the colour, vibrancy and detail to make the best of photos and videos. Those keen on viewing their media on a tablet should consider the Apple or Dell instead. Google's Android operating system (OS) runs the show and, while it's recognisable visually, it isn't nearly as easy or intuitive to use as it is on the Dell – largely due to the low quality of the resistive screen. There isn't even the official Android Market apps store included, with the tablet-centric SlideMe included instead. There are some interesting apps available for download but, overall, they are lacking in both the quantity and quality of the official Android Market store. The 1GHz processor struggles to run the OS as smoothly as it should and we experienced some lag when running most tasks. As a result, the tablet is frustrating to use on a regular basis, so even at this low price point it is hard to recommend. A 2GB MicroSD card is included, which will fill up pretty quickly if you intend to carry around music and movies, but you are able to expand storage to a maximum of 32GB if you wish. The 7-inch design ensures this is a tablet you can easily slip into a jacket pocket, with sturdy build quality also impressing, but the 209-minute battery life is limiting. 802.11n Wi-Fi is included and, once up and running, we found the wireless web experience to be good but not exceptional. Connectivity-wise, the two mini USB ports and HDMI-out are more generous than the iPad. Should you want a device for carrying high-definition movies which you can watch on an HDTV at home, this will serve you well, if you upgrade the storage. All in all, the Tablet 6000 sadly isn't a device we can recommend. Portability is merely satisfactory and while the spread of ports is decent, we consider the Apple and Dell a wiser investment and money much better spent.